America has a rich heritage of native peoples and language. The Kickapoo tribes inhabited the central continent, and thankfully continue today in several states. 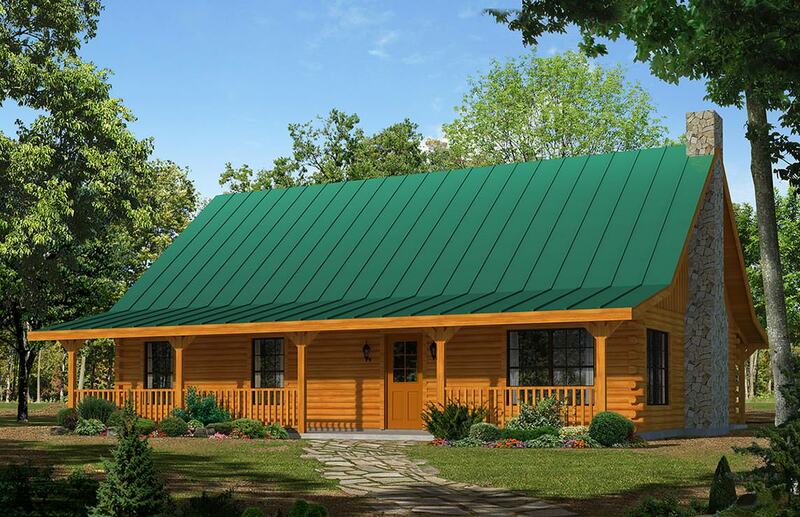 The Kickapoo log home floor plan from Satterwhite is one of many we offer in the 1,600 sq ft size range, and also our largest 1 bedroom plan. One bedroom designs are not terribly common in the general housing market, but because log homes are frequently built by empty nesters for retirement living, or as 2nd homes at special destinations, they can be ideal for some couples and families. The Kickapoo allocates extra space to the master suite, which becomes the first plan in the Satterwhite range to feature a spa tub in the master bath. Consistent with modern home design, the kitchen, dining, and family rooms are an integrated space, all sharing a lofted ceiling and commanding view of the stone fireplace. The utility room with sink, laundry and space for a freezer round out the main floor. Upstairs, in the lofted design, there is finished space suitable for a variety of purposes from climate controlled storage to a home office.